Manual stereological methods and conventional image analyzer are sometimes difficult and time-consuming to obtain the informative data for some complicated microstructures in metals. To solve these problems, a computer assisted quantitative analysis was explored. Several examples, including the measurements of fine-scale ferrite grain size and pre-eutectoid ferrite volume fraction in low carbon steel, the determination of particle parameters in intermetallic matrix composite and the investigations of recrystallization dynamics and grain growth during annealing in ordered alloys, are presented. Also the error was evaluated. 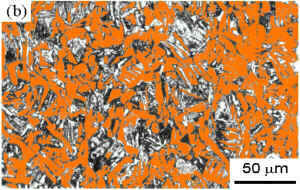 Quantitative metallography plays very important role in materials science and engineering [1,2] . It can provide relations between processes, microstructures and mechanical properties and supply the first hand data that is necessary and important to establish a reasonable mathematical model. It enables the costly trial and error method to be replaced by a scientifically based experimental procedure resulting in the improvement of known materials and the development of new ones. The manual quantitative metallography is sometimes difficult, tedious and time-consuming especially when the microstructure is complicated or of a fine scale. The automatic measurement of an image analyzer can give inaccurate data if the microstructure has a bad contrast or the analyzed features have a discontinuous outline. Recent fast development of computer techniques improve image processing remarkably [3,4]. Several famous softwares such as Corel Paint and Adobe PhotoShop have commercially been developed for image improvement. In the meantime the softwares such as ImageTool has also been developed for quantitative analysis of image. These achievements supply other approaches to quantitative metallography. In comparison with conventional methods the use of computer techniques offers much more flexibility: it can not only perform measurement automatically, but also self-automatically (described later). The measurement of ferrite grain size and pearlite volume fraction in the fine scale ferrite-pearlite microstructure and the quantitative analysis of pre-eutectoid ferrite in low carbon steel. The determination of particle parameters in Fe3Al-5%Cr based composites (unless otherwise stated, every composition is given as atom percent). The characterization of recrystallization dynamics and grain growth dynamics in advanced intermetallic materials. Where s is flow stress,s0 is lattice friction stress, k is constant and d is grain size. Table 1 lists the composition of the low carbon steel (SS400) investigated. The rods with a diameter about 10 mm were produced by forging the continuous cast slab with a size of 80 mm´80 mm at 1250° C and followed by air cooling. The cylindrical specimens with a size of 8 mm (diameter)´ 15 mm (height) were cut from the rod. The fine scale ferrite-pearlite microstructure was produced by heavy deforming the specimen with a true strain about 1.6 who was cooled from the austenitising temperature 900°C to the deformation temperature 770°C at a cooling rate of 50°C/s. The microstructural observations were carried out using optical microscopy after polishing the sections and etching them in a 3% nital solution. 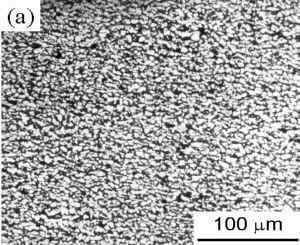 Fig 1: Fine scale ferrite-pearlite microstructure in the low carbon steel SS400 heavily deformed at 770°C, (a) original optical microstructure; (b) after image processing. Fig. 1(a) gives the optical microstructure of fine scale ferrite-pearlite microstructure. Two frustrating problems arise for quantifying the microstructure. First, due to the small ferrite grains and pearlite (less than 5 mm), manual measurements may need to be performed at magnifications ranging from 500´ to 1000´ . At these magnifications, the problem of diffuse reflectivity results in a low contrast between grains and boundaries. Second, the fine pearlite with an appearance of island locates along ferrite grain boundaries or at triple junctions. When human counting of the intercepts is performed to measure the ferrite grain size considerable judgements must be employed to subtract that produced by pearlite. After acquiring the image by scanner two methods can be taken to measure the ferrite grain size. One is to measure the grain size self-automatically by drawing a line on every grain using image analysis software. In many cases it is popular because people can judge the grain outline accurately. Another is to measure the grain size automatically by computer. In order to improve the precision an image processing is necessary, including thresholding, painting and delineating the grains if the boundaries are incomplete  . The data obtained shows that the results are very close for these two methods. The ferrite grain sizes are 3.3± 0.1 mm and 3.6± 0.1 mm for the self-automatic and automatic methods, respectively. In practical applications the precipitation of second phases or second microstructure is often used to adjust the steel properties. The steels can be strengthened by the precipitation of carbide or pearlite. Therefore, a determination of their parameters is important. Here the measurement of pearlite volume fraction is taken as an example (Fig. 1(a)). It is not easy to accomplish it by manual stereological methods. However, we can extract the pearlite parts from the overall matrix by adjusting the image contrast, thresholding the image and painting the part of pearlite with the assistance of computer (Fig. 1(b)). The area fraction of pearlite with black can effortlessly be evaluated by the image analysis software. The volume fraction 20.2% is obtained. It is 23.0% calculated from Fe-C equilibrium diagram. During fast cooling from the austenite region the Widmannstatten microstructure, which is often harmful to the mechanical properties, is easily formed in low carbon steels. Its appearance with coarse and irregular acicular shape makes it very difficult to measure its volume fraction by manual stereological methods. Fig. 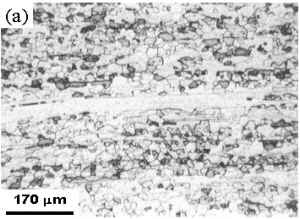 2(a) gives the original image in which two types of microstructure exist: ferrite (Widmannstatten microstructure) and martensite. The low carbon steel investigated is the same as that described in the section 2. The pre-eutectoid ferrite was formed by cooling the specimen from the austenitising temperature 900°C to 650°C at a rate of 50 °C/s, and then water quenched. Fig 2: Morphology of pre-eutectoid ferrite in the low carbon steel SS400 cooled from 900°C, (a) original optical microstructure; (b) after image processing. The ferrite is delineated with the use of magic wand mask and freehand mask tools and then painted by black color in the image processing software (Fig. 2(b)). After finishing the delineation the quantitative measurement could be done in a few seconds. The ferrite volume fraction measured is about 49.3%. The hard particles such as oxides, carbides and borides are often added to the metals and single phase alloys to obtain a strengthening effect, which greatly depends on their volume fraction, aspect ratio and distribution in the matrix. The quantitative analysis plays a very important role in modeling the mechanical properties as a function of particle parameters  . Iron aluminides with a composition near Fe3Al are promising for applications used as oxidation and sulfidation resisting steel-like materials at ambient and intermediate temperatures . However, they have a poor strength above the critical temperature of about 600° C. The addition of hard particle TiB2 can increase the high temperature strength. The Fe3Al-5%Cr alloy containing TiB2 particles was melted by Exo-melting in vacuum. The microstructural observations were conducted using scanning electron microscopy (SEM) after polishing the specimens. 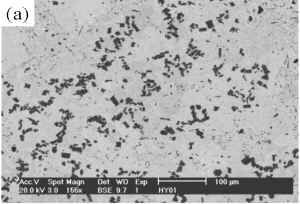 Fig 3: Cast microstructure of the Fe3Al-5%Cr alloy containing TiB2 particles, (a) no image processing; (b) after image processing. Fig. 3(a) shows the cast microstructure. The large contrast difference between the particle and the matrix makes it easy to extract the particles by thresholding (Fig. 3(b)). The volume fraction of TiB2 is determined to be 12.9%. Providing that the densities are 6.7 g.cm-3 and 4.6 g.cm-3 for Fe3Al and TiB2, respectively, a weight percent of 9.2% can be calculated for TiB2. The lengths of major axis and minor axis are 11.9 mm and 6.2 mm, respectively. The corresponding aspect ratio is 1.8. It should be noted that particle touching affects the measurement precision. The computer may consider touching particles as one particle. Although this can not affect the determination of area fraction the aspect ratio may be misunderstood. Increasing the magnification to separate the particles can alleviate the error. Another effective method is to differentiate the touching particles using erosion function. Fig. 4 shows a comparison for the Fe3Al-5%Cr alloy containing TiB2 particles with and without erosion (see where pointed by the arrows). Fig 4: TiB2 clustering in the Fe3Al-5%Cr alloy containing TiB2 particles, (a) without erosion; (b) with erosion. The determination of recrystallization volume fraction is absolutely necessary to check or establish recrystallization dynamic model. In general, there is no difference in contrast between the unrecrystallized and recrystallized regions. People must judge the recrystallized part when they measure its volume fraction with manual stereological methods. It is not possible to automatically distinguish them by conventional image analyzer. However, by using functions such as freehand mask and magic wand mask the outline of recrystallized or unrecrystallized parts can be sketched easily. 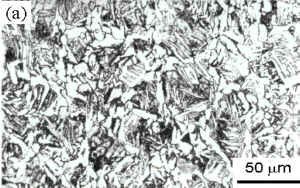 Fig 5: Recrystallized microstructure in the Fe3Al-5CrZrMoNbB alloy annealed at 750°C for 15 min. (a) original optical microstructure; (b) after image processing. A typical example is given in Fig. 5. The Fe3Al-5%Cr-0.1%Zr-0.5%Mo-0.5%Nb-0.05%B alloy used was prepared by vacuum induction melting. After homogenization at 1000° C for 24 h the ingot was forged to bars at 1000° C in air. Rolling processing sequences in the temperature range from 850° C to 600° C were then carried out and sheets of 2 mm thickness were obtained with a warm reduction of about 60%. The specimens cut from the sheets were annealed at 750°C with various times in order to investigate the recrystallization dynamics. All specimens were water quenched after annealing. The microstructural observations were conducted on the longitudinal sections using optical microscopy. Fig 6: Plot of as a function of in the Fe3Al-5CrZrMoNbB alloy annealed at 750°C. If plotting a linear relation should be obtained. Fig. 6 confirms that the recrystallization dynamics in Fe3Al-based alloys follows the KJMA equation in the same way. The least-square line that fits these data points yields a value of 0.63± 0.06 for k. It is comparative with other intermetallics such as Ni3Al (0.8 to 1.0) , but much lower than conventional metals or alloys for which the k value is often 3 . The microstructural refinement can improve the room temperature mechanical properties. It is interesting to investigate the dynamics of grain growth during annealing. 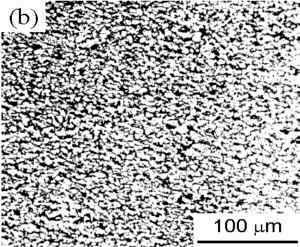 Quantitative analysis of grain growth can not only setup the relationship between microstructure and mechanical properties, but can also be used for the thermomechanical process. Where C and n are constants. This is in agreement with the grain growth dynamics in conventional metals or alloys for which "n" value ranges from 0.20 to 0.40. Some other intermetallics such as Ni3Al were reported to have the same result with "n" value 0.18 to 0.27 . Fig 7: Plot of as a function of in the Fe3Al-5CrZrMoNbB alloy annealed at 750°C. It is not difficult to decrease the statistical error because the computer can do a large amount of measurements if you would. There is no any problem for the statistical confidence degree to arrive at a level of 95%. The error mainly comes from systematic error. It greatly depends on whether the analyzed objects are well defined. Other errors come from the microstructural duplication. It can be decreased by adjusting the machine to obtain a well state. 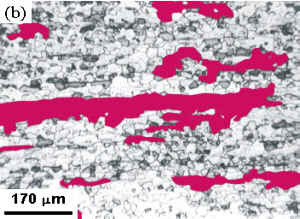 With the assistance of readily available computer image processing and analysis techniques the quantitative analysis of some typical microstructures in metal materials, which are difficult or time-consuming for manual stereological methods and conventional image analyzer, can be carried out with a high efficiency. The measurement error mainly depends on whether the analyzed objects are well defined. The authors are grateful to University of Texas Health Science Center in San Antonia for the supply of free image analysis software Image Tool version 2.0. Thanks are also expressed to the authors of this software Don Wilcox, Brent Dove, Doss McDavid and David Greer. The research was supported by IUAP (Interuniversity Poles of Attraction) project P4/33, Belgium. E. E. Underwood. Quantitative Stereology. Addison-Wesley Publishing Company, USA, 1970. R. T. DeHoff and F. N. Rhines. Quantitative Microscopy. McGraw-Hill Book Company, USA, 1968. P. Osmont, H. Petitgand and J. R. Philippe. "Use of Image Processing in Iron and Steelmaking Industry". Revue De Metallurgie, 97, 2000, pp. 187-96. J. C. Russ, W. D. Stewart and S. Fletcher. "Image Analysis of Difficult Structures: The Separation of Touching Phase Regions". in Proceedings of the Twenty-First Annual Technical Meeting of the International Metallographic Society, P. J. Kenny, G. S. Cole, D. O. Northwood, J. Wylie and G. F. Vander Voort, Ed., The International Metallographic Society, Columbus, Ohio, USA, 1989, pp. 23-37. T. W. Clyne and P. J. Withers. An Introduction to Metal Matrix Composites. Cambridge University Press, Cambridge, 1993. C. G. McKamey, J. H. DeVan, P. F. Tortorelli and V. K. Sikka. "A Review of Recent Development in Fe3Al-based alloys". J. Mater. Res., 6, 1991, pp. 1779-1805. R. W. Cahn. "Recovery, Strain-Age-Hardening and Recrystallization in Deformed Intermetallics". in High Temperature Aluminides and Intermetallics, S. H. Whang, C. T. Liu, D. P. Pope and J. O. Stiegler, Ed., TMS, Warrendale, PA, 1990, pp. 245-70. I. Baker. "Recovery, Recrystallization and Grain Growth in Ordered Alloys". Intermetallics, 8, 2000, pp. 1183-96. B. Zhou, Y. T. Chou and C. T. Liu. "Recrystallization and Grain Growth in Ni3Al With and Without Boron". Intermetallics, 1, 1993, pp. 217-25. F. J. Humphreys and M. Hatherly. 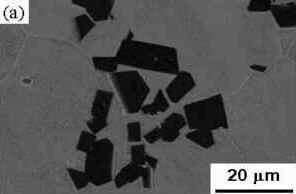 Recrystallization and Related Annealing Phenomena. Pergamon, 1995, pp. 173-220.